A few weeks ago, my great-uncle Donald sent me this book because he had been reading my articles in the Northwoods Sporting Journal and thought I would enjoy this find. 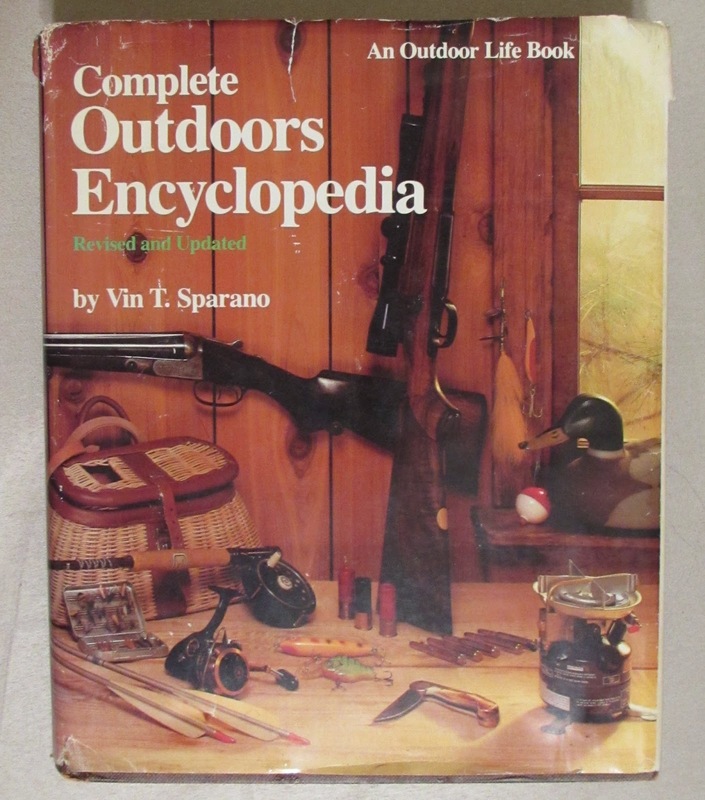 While this is not super old, it is older than me and it was great to read through the book and "learn" how to hunt, fish, hike, camp etc. The great thing about being an outdoors-woman right now, is the openness and excitement that I have found with other writers and outdoor-men in my life. In order for us to evolve and become more interested in getting outdoors, it takes someone who is willing to teach us. I hope that when Uncle Donald sent this to me, he saw that too. It is a way to pass on a deep hunting heritage to other family members and create more hunting stories for future generations. There is an entire section about what type of ammunition you should use for each gun you may be hunting with. You can learn about different knives you will want to bring with you or you may want to know how to tie a variety of knots when you are camping, boating or hunting. Reading this book has been such a great experience - and I am learning more about the outdoors. Some things change, some things I need to learn (like fishing) but some things like gutting a deer have not changed (at least when it comes to how we do it and how the book suggests it be done). 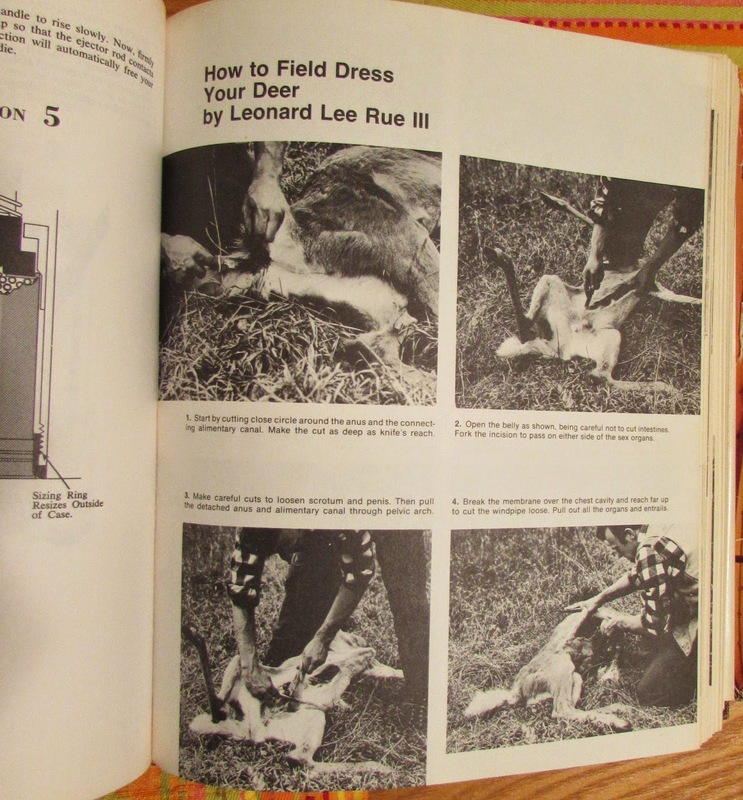 There is a section about still hunting and stand hunting that I need to spend more time reading. There are pictures of the ideal spot to hit a deer depending on how they come into view and where the meat is on them. The best part is seeing what was suggested as a part of a successful hunt back in the 70's and early 80's and compare it to what Dad and I do now and how (overall) successful we have been. There is no mention of trail cameras, obviously, so looking at the lack of technology in hunting and realizing how much Dad and I use cameras - we have three of them - its such a classic way of hunting. I need to brush up on these pages a lot! I have a fishing trip planned for next month with the sole purpose being to catch a couple of fish that we can eat. I am hoping to get a couple of salmon but really, if I can cast and land a fish, I will be happier than a kid on Christmas morning. It is such a new thing to learn and I hope that when my kids get old enough (like 5 years old) they will have an interest in fishing and then we can have hunters and fishermen in the family. We do have a pretty awesome Spider Man fishing pole ready to be used! There is a section about proper casting and the types like backhand lob, straightaway cast and flip cast. There is a definition of rod and reel vs fly fishing and how to properly do both. Pages upon pages of world records for saltwater and fresh water fish are listed in the back of the book. Maybe someday, if I ever retire, I could pick a couple of these records and see if they still stand or update them. I didn't spend much time looking at them, so I dont know where they were, but if any were in Maine, I will check them out. Who knows, maybe I will land the big one. Ha! I love this photo of an outdoors-woman! A compound bow to fish though? 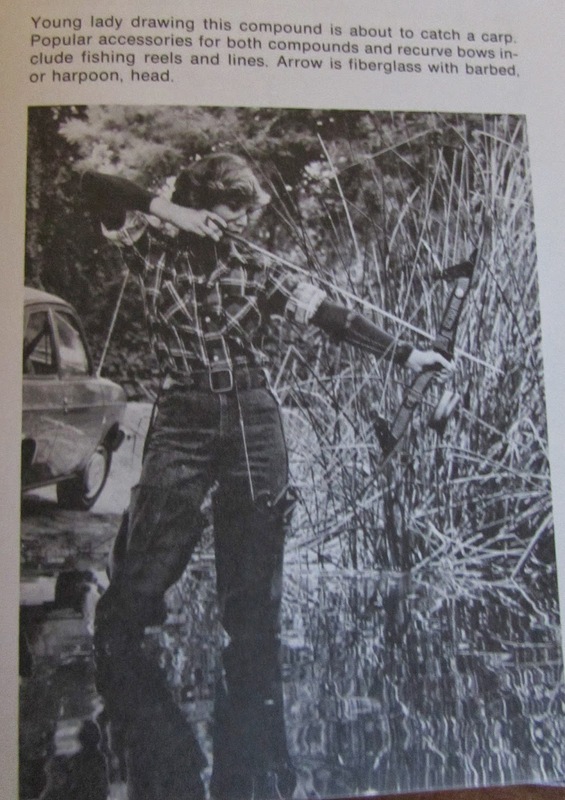 There is a large section of the book dedicated to archery and the different types of bows, arrows and how best to shoot them. Black Bear - "the meat is dark and tends to be coarse. But it is very good when handled and prepared properly." Whitetail Deer - "whitetail venison, if treated like good beef will taste delicious. Prompt and proper field dressing insures fine meat." Caribou - "caribou meat is rated excellent." The list includes the usual suspects of animals that we do eat but also mentions raccoons, bobcat, lynx and squirrels of all varieties. So, if you come across any old hunting books, feel free to send them my way so that I can add them to my new collection! 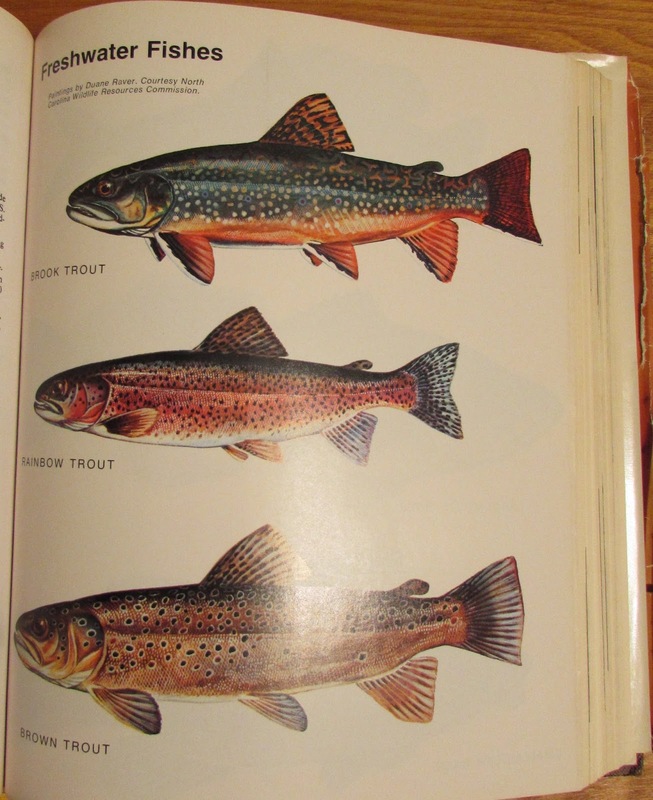 There is something magical about going through an old hunting book and thinking about a time when it was about getting out into the woods, loving and learning nature and bringing home tonight's dinner. That looks like a book I would put in my library. I love reading all that stuff, you always find something new to add to your hunting.